First, you should read through the Structured Data Reference on Googles pages to learn more about what you can and do and what you shouldn’t do. As you could read on the reference (linked above) you need schema.org’s JobPosting Schema to get a Rich Snippet in Googles (and maybe other search engines) search results. 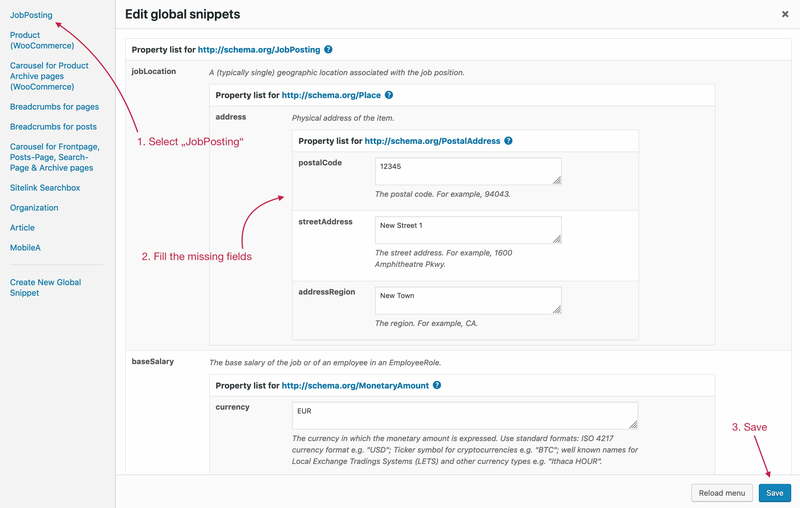 As you might now, SNIP allows you to create so called Global Snippets. That is a schema syntax that can be populated to multiple pages (in this case: job posts) at once so that you don’t need to create a schema for every single post one by one. Now head over to “Global Snippets” and create a new one. Then type “JobPosting” into the field where it says “Select a thing”. 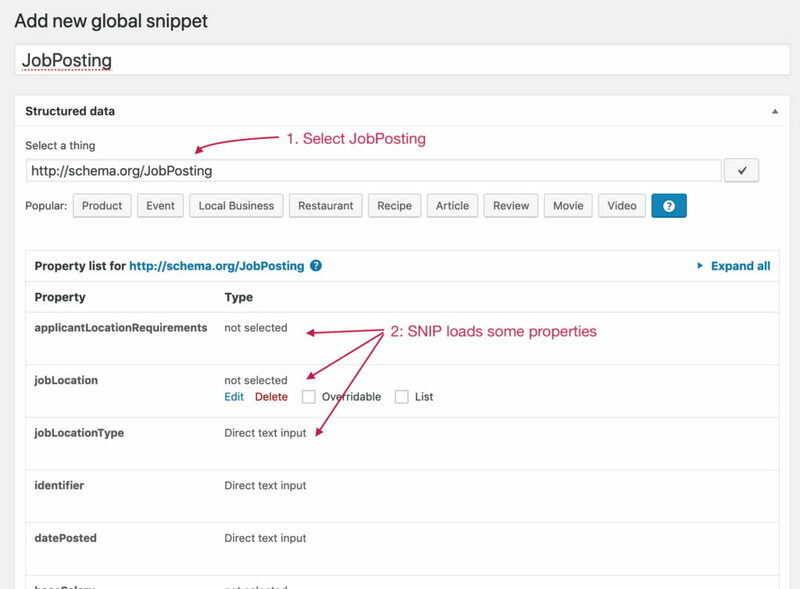 After selecting schema.org/JobPosting SNIP will load some properties for you already. Of course you can always add more if you need them. The properties are loaded for your convenience so that you don’t have to add them one by one. The JobPosting schema in SNIP with some pre-loaded properties. Note the following: Because the WP Job Manager Plugin does not allow you to set all of the properties you need, you have to mark them overridable. Please have a look at my Structured Data Training, especially the video where I explain how to overwrite global snippet properties to learn more. Now go to SNIP -> Settings and select “Jobs” for the Post Types. Save your settings. create a job posting or edit an existing one. Fill all the fields you need within the WP Job Manager Plugin. Then open up the Global Snippets window by clicking the “Edit global snippets” button in the sidebar. Click “JobPosting” in the left sidebar of the newly opened window (see screenshot below). Save your settings and close the window. Now there is only one thing to do: removing the Structured Data that the WP Job Manager Plugin generates. This needs to be done because otherwise you’ll have two JobPosting schemas on your job postings. This could potentially confuse search engines. The easiest way is to just install the WP Job Manager Structured Data Deactivator plugin that I wrote and is available for free on Github (direct download). Now head over to Googles Structured Data Test Tool and test your job postings. Don’t forget to flush your cache plugins caches (if any).